The threat of deflation is over in the U.S. and now is the time for the Fed to adjust, according to Societe Generale analysts. The problem lies with the Fed’s current inclination to pump money in the system trying to fight unemployment. SocGen analysts argue that the Fed’s assumption that NAIRU, or the non-accelerating inflation rate of unemployment, is at 5.0 to 5.3% may be way off. NAIRU could actually be closer to 6.3 or even 7.5%. That matters because the Fed may be trying to keep policy easy for the sake of an unemployment rate it can never reach. Societe Generale analysts believe the Fed should adjust its language at the March 15 meeting, to reflect stabilizing core inflation, rising commodity prices, and the potential that other costs, like public transportation, will rise. 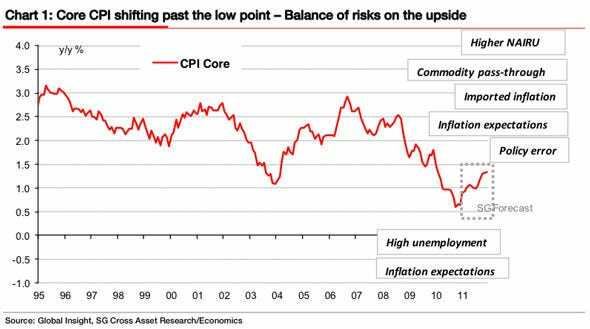 In its latest FOMC statement, the Fed noted that despite rising commodity prices, core inflation measures are “trending lower“. The next FOMC meeting is March 15 and if our CPI forecasts are correct, that characterization will no longer be valid. The Fed may have to replace it with a statement that core inflation is “stabilizing at low levels“. This is far from signaling imminent tightening, but it is a subtle signal that policy accommodation is coming to an end.